BARCELONA, MOBILE WORLD CONGRESS 2012 — This year I decided to cover the Mobile World Congress without a computer. Or at least, without my MacBook. I live in Barcelona, so I knocked out a couple of posts on my iMac when I was at home, but on the show floor and in the press lounge I relied solely on my iPad. And amazingly, it was up to the task. There are some annoyances, but with a combination of perseverance (or just stubbornness) and the right apps, I got a pretty easy system going. The big problem with blogging on an iPad is that you can only have one window on screen at a time. For a job which requires that you do research on the web, edit and upload photos and read press releases, all before you write the post, things are a lot easier on a big 27-inch iMac screen. However, with the right combination of apps, and a little help from hardware, these separate tasks can be done without too much pain. So here, step-by-step, is how I did it. Most importantly, accept no press materials on CD, DVD or USB stick. Instead get a card with the web address of what you need. Better still, just take a photo of the little spec card on display next to almost every device. Bonus: you won’t have to remember which almost-identical phone is which. Also, be sure to take all photos and videos in iPad-friendly formats. JPEG will transfer faster than RAW when using the camera connection kit, and while the AVCHD videos my Panasonic GF1 spits out are bigger than the Motion JPEGs, iMovie can’t read them. 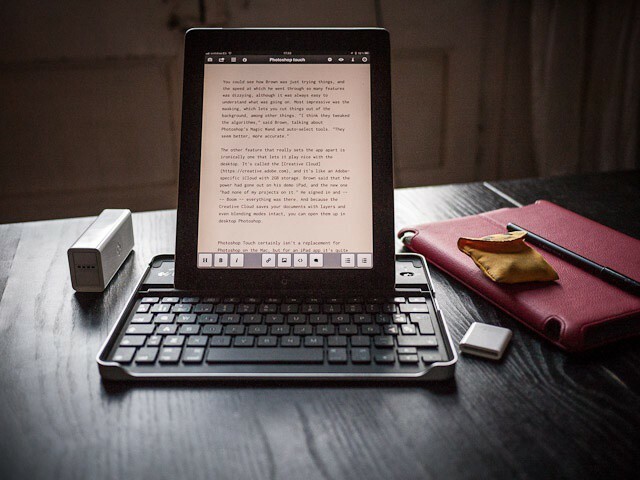 I write my posts in Writing Kit, an iPad app which uses markdown, and presents an extra row of keys on screen, even when using an external keyboard (in this case, the Zagg/Logitech keyboard case). It’s rock solid, saves to Dropbox and exports text however you want it. Even more important are its research tools. You can quickly search for a fact with a built-in research popover powered by DuckDuckGo, or you can flip to the full browser. And Writing Kit also supports TextExpander, which is essential to any writer. There are other features (Instapaper support, for example), but they weren’t used this week. When done, I pasted the HTML into our WordPress back-end using Mobile Safari. There is a WordPress app, but I hear its crashy, which is a very bad thing when you’re working this fast. Titles, tags and photos are all added from here. Photos are a pain on the iPad. Or rather, uploading photos is a pain, as the open/save buttons in browsers don’t work. To get around this I used Blogsy. This is a standalone blogging app that can also edit posts, but I find the interface mystifying. It works great for uploading photos, though. You just tap an icon to open your photo roll, and drag the photos you want to the destination you want to send them too. As I was also filing stories for Cult of Android, the ability to batch upload different pictures to different locations was great. Once uploaded, the photos show up in WordPress’s media library tab. Easy. To actually process the photos before sending them, I used the excellent SnapSeed. I have many other photo apps on my iPad, but none gets me punched-up, ready-to-publish photos quicker or easier. The only thing lacking is a way to resize images. I got around this at first by opening them up in Photogene, but that got old fast, so instead I just let WordPress resize them on upload. Finally, I used iMovie to post a video clip. I also have the fuller-featured Avid Studio, but I’m more familiar with iMovie, and it’s perfectly good for a quick trim and adding a few titles before sending to YouTube. And that’s it. The first few posts were like pulling teeth, and I swore I’d lug my 13-inch MacBook with me the next day. But after I got into the flow, I was moving almost as fast as I can with a “proper” computer. The iPad is actually better in some ways. It’s way lighter, for a start. Its day-long battery life meant I was never fighting to find a power outlet like my esteemed colleague John Brownlee, and the 3G meant I could post direct from the show floor instead of being tied to the press lounge. And the Logitech keyboard turns out to be more than capable for serious use. In short, my experiment worked out way better than I had hoped it would.